Dad, Dave Ramos and his son Alex had a great Father’s day. Dave winning the regatta with son Alex placing second in a 14 boat fleet. The weather was hot! The warm breeze of 9 mph with gust coming in at 12 to 15mph put the fleet on the edge of using A and B sails during the whole event. With those conditions the group sailed with a mix of A and B rigs for each race. You would think that with the choice of two rigs being used the wind would have been consistent. Nope! There were a good share of wind shifts and windless holes caused by houses around the pond making the day challenging. At the end of the day, Dave Ramos the regatta winner scored just 31 points in this 16 race regatta, son Alex who placed second scored 58 points with Tom Rummage placing third two points behind. The top five was rounded out with Dave Branning 4th, 68 points, and Gerry Cobley tied with Michael Roberson at 69 points. Gerry won the tie breaker. Many thanks to the skippers who traveled many miles to attend this regatta on the North Caroline shore. 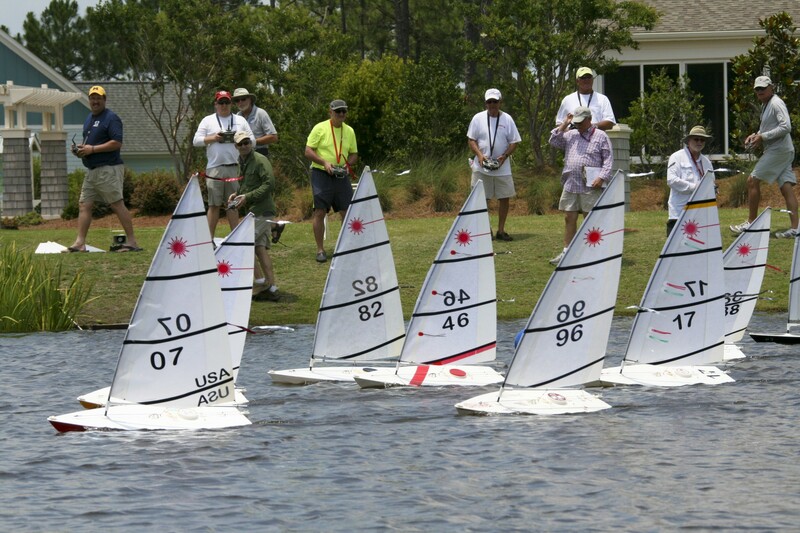 A special thanks to St James Plantation Model Yacht Club for hosting the regatta, Jim Flach for his grand photography, Tom Rummage, Michael Roberson, Jacques Rioux, and Carmen Gaudreaux who gave their time to make this a super regatta.